6 MMS November 2017 CONTENTS NOVEMBER 2017 ■ VOLUME 90, NO. 6 ■ MMSONLINE .COM FEATURES 74 The Watchmaker and the Machinist Precision machining and old-world craftsmanship combine to produce some of the only U.S.-made mechanical wristwatch movements. 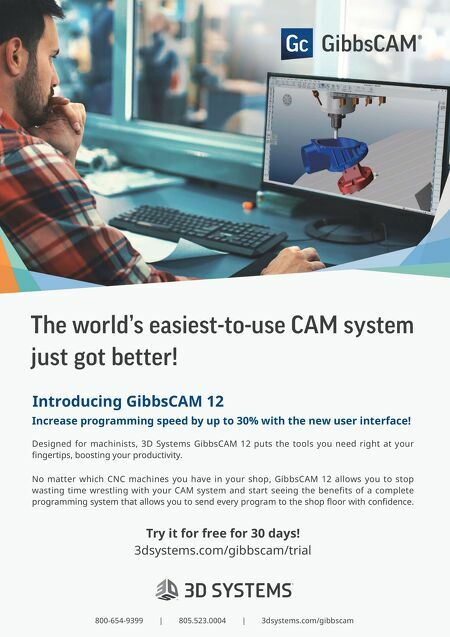 BY MATT DANFORD 80 One Five-Axis Process, 10 Elements of Automation The new five-axis machine at Phoenix Proto has a pallet pool with loading system, but there are many other less obvious elements of automation in this precision mold-machining process that are just as essential. 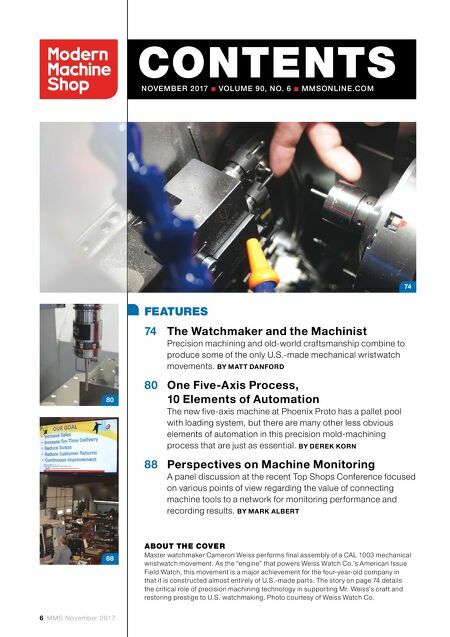 BY DEREK KORN 88 Perspectives on Machine Monitoring A panel discussion at the recent Top Shops Conference focused on various points of view regarding the value of connecting machine tools to a network for monitoring performance and recording results. BY MARK ALBERT 80 88 74 ABOUT THE COVER Master watchmaker Cameron Weiss performs final assembly of a CAL 1003 mechanical wristwatch movement. As the "engine" that powers Weiss Watch Co.'s American Issue Field Watch, this movement is a major achievement for the four-year-old company in that it is constructed almost entirely of U.S.-made parts. The story on page 74 details the critical role of precision machining technology in supporting Mr. Weiss's craft and restoring prestige to U.S. watchmaking. Photo courtesy of Weiss Watch Co.